The LeBrun Toyota team truly appreciates the customer testimonials left from each and everyone of our customers. We encourage all past and present customers to leave a review telling us about your experience at our Toyota dealership! They were excellent. They gave discount because I am a veteran. 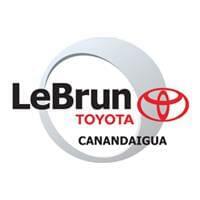 Rasheem ,our salesman was very helpful, kind and courteous .I highly recommend LeBrun Toyota. We love our Toyota Camry .